research indicates the two methods compliment each other rather than compete. That’s why the company offers direct mail and email solutions. Possessing two college degrees but unable to find a job in his field during the last major recession, Post Haste’s president, Jack Ellis, began a mailbox service in a small store front on Annapolis’ Church Circle in 1983 based on a suggestion from his father who’d seen a successful mailbox service in Harlem, New York. 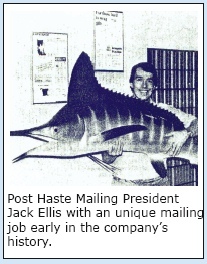 In addition to offering post boxes for businesses and individuals, he also mailed packages of every kind including artwork from local galleries and a seven foot stuffed marlin. When a business client suggested expanding his services to include mailing, Ellis bought a used tabletop folding machine and inserter and began doing mailings for the Chesapeake BayFoundation and other non-profit organizations. The company moved to Hudson Street in 1987 and then expanded again in 1998 to its current location at 90 Russell Street, a 10,000 square foot facility. Today, Post Haste has 21 employees and prepares several million pieces of mail monthly for a wide variety of clients including Anne Arundel Community College, Anne Arundel Medical Center, Crosby Marketing, the Maryland House of Delegates, the U.S. Naval Academy, Graul’s Market and many more. As a life-time resident of the Chesapeake Bay area and an avid boater, Ellis began Post Haste’s recycling efforts more than 15 years ago. Today Post Haste recycles over 900 lbs of cardboard each week as well as scrap paper and skids and continues to investigate additional ways to help protect the Bay.